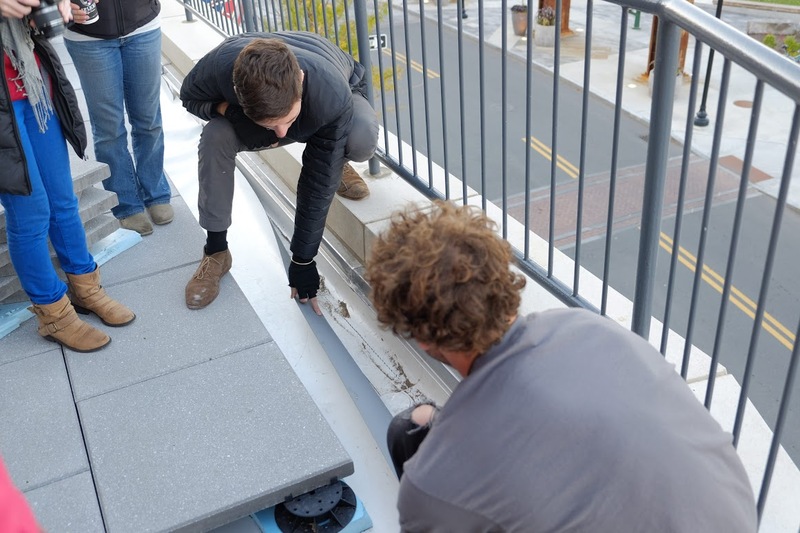 On a blustery October afternoon, Boston Architectural College and Recover Green Roofs completed the second installment of the SASLA sponsored Green Roof Tour series. Once again led by Brendan Shea, Owner and Director of Field Operations for Recover Green Roofs, a mix of Architecture and Landscape Architecture students were given access to one of Recover’s current projects located at Assembly Row, a new urbanism development in Somerville, Massachusetts. 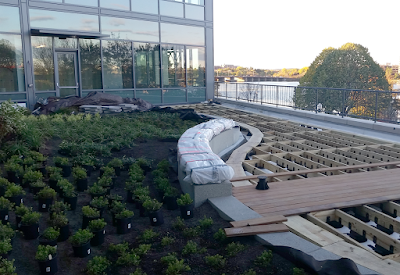 Copley Wolff Design Group, a local Boston Landscape Architecture and Planning firm, designed the intensive green roof which spans over three separate roofs and is made up of a series of decks, gardens, benches, curbing, and plants. 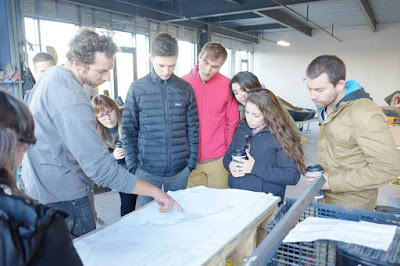 Diving into the large project, Brendan Shea allowed students to view and use the construction documents for the project as a guide to the tour. 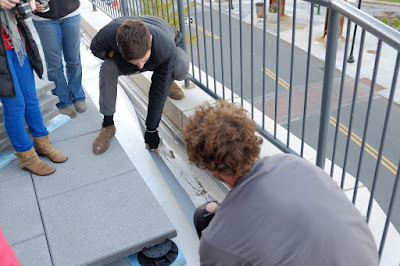 Because the project was roughly at 80% of completion, students received an in depth and personal demonstration of the ins-and-outs of green roof function and design. Below a layer of raised cement pavers a subsurface irrigation system allows for all three roofs to be supported by one main water source. A protective drainage layer receives stormwater and protects the building envelope from any potential leaks, while a cutting edge Low Voltage Vector Mapping system allows Recover to locate breaches and normally undetectable leaks in the roof membrane eliminating the chance of any long-term water damage. The project required the Recover team to figure out a way to lift multiple 3000 pound cement pieces of curbing and benches to the roof. “This is what I love about this job, trying to figure out how to make things possible that really do not have any precedent,” said Brendan Shea talking about the homemade rigging system used to lift the cement pieces. The curbing was finished with Cedar benching and a densely laid planting plan will undoubtedly provide well-needed relief for the users of the newly built office spaces. 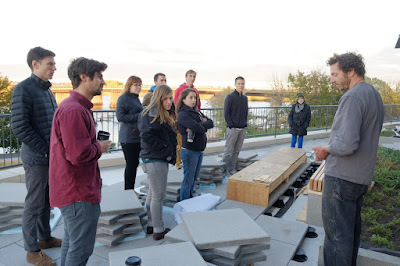 The Assembly Row Green Roof and Fenway Farms Green Roof tour were both awe inspiring and informational opportunities for BAC students. In a time when sustainable design rules and green space can be hard to find, green roofs are on every design students’ mind. Having the chance to view urban agriculture on a iconic stadium and a green roof in the works at a developing urban neighborhood were invaluable learning experiences. As Jess Alpert put it, “It seems like agriculture on roofs should be a no-brainer for the health of our cities. Green roofs could be the solution for growing food locally, without disturbing species on the ground. What better use of space, a vacant ‘lot’, now a productive urban asset!” A long term goal for the students who attended the tour was to find a way to make a green roof possible at the BAC to use as an experiment for learning, a precedent for other downtown Boston buildings, and a place to relax during mid-reviews!